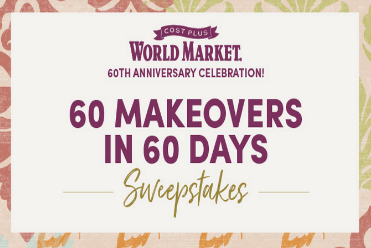 Cost Plus World Market 60 Makeovers in 60 Days Sweepstakes – Win a Tiny House & a World Market gift card! Win a Tiny House and a $1,000 World Market gift card! ENTER SWEEPSTAKES HERE – World Market Sweepstakes page. ENTRY LIMIT – Limit one (1) entry per person per day. ELIGIBILITY – The Cost Plus World Market 60 Makeovers in 60 Days Sweepstakes is open to legal residents of the fifty (50) United States and District of Columbia who are 18 years of age or older at the time of entry. SWEEPSTAKES ENTRY PERIOD – The Promotion begins at 12:01 a.m. Eastern Time (“ET”) on 08/02/18 and ends at 11:59 p.m. ET on 09/30/18. PRIZES – GRAND PRIZE (1): A Tiny House with an approximate retail value (“ARV”) $55,000; a selection of Cost Plus World Market furnishings with an ARV of $5,000; and a $1,000 Cost Plus World Market gift card. Total ARV of Grand Prize: $61,000.00. The Grand Prize winner may elect to receive a $4,000 Cost Plus World Market gift card in lieu of the Tiny House portion of the Grand Prize. FIRST PRIZES (60): A $1,000 World Market Gift Card. WINNER’S LIST – For the names of the winners, available after 10/12/18, or for an additional copy of these Official Rules, mail a self-addressed stamped envelope to: Cost Plus World Market 60 Makeovers in 60 Days Sweepstakes, 6547 Cahuenga Terrace, Los Angeles, CA 90068. Please specify “Rules” or “Winners List”. Requests must be received by 11/30/18. Vermont residents may omit return postage for “Rules” requests.